The VGA cable that allows the iPad to be connected to a projector is a must have for any classroom teacher. My favorite uses are showing BrainPop to the students, iMovies students made, and many more. 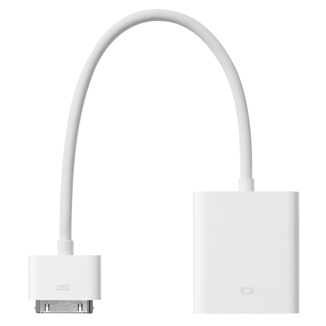 You can pick up a VGA cable for around $30 from Apple or a third party retailer. I cam e across Planets the other day and it is a fun app for amateur astronomers.I can see it as a useful resource in the classroom when discussing the solar system, planets, stars, constellations (mythology), etc. Check out Planets another great free app. Eliminate students feeling like you always pick them, make sure you ask every student a question and take it one step further by collecting data for their responses. The Stick Pick App is another in a great line of tools for teachers in the classroom. There are so many great Apps out there from Angry Birds, which keeps my children occupied, to iMovie that allows for the creation of high quality movies to be recorded, edited and published. One of the most useful Apps that I have found is Posterous that links to a blogging style website (www.posterous.com ). The website set up is incredibly easy and user friendly. Once the website page is set up using the App either on the iPad or iPhone brings this to it’s purest use for a classroom teacher. I have the App both on my iPhone and iPad and use it daily as a method to post on the internet my classes’ homework for the day. I use the post feature in the App to take a picture of my homework board and then post it to the posterous website. This becomes useful for the student who doesn’t write the assignments correctly in their daily agenda, is home sick or a parent who wants to verify what the nightly homework assignment for their child is on any given night. I will also post (pictures) any other pertinent information such as vocabulary lists, board notes that are complex, etc. that will help the student and their parent once they are away from my classroom. Taking the two to grab the iPhone/iPad 2 open up the App, snap a picture, type the date and click send has made my life as a teacher easier as students and parents have no reason not to know what the nightly assignment is for class.